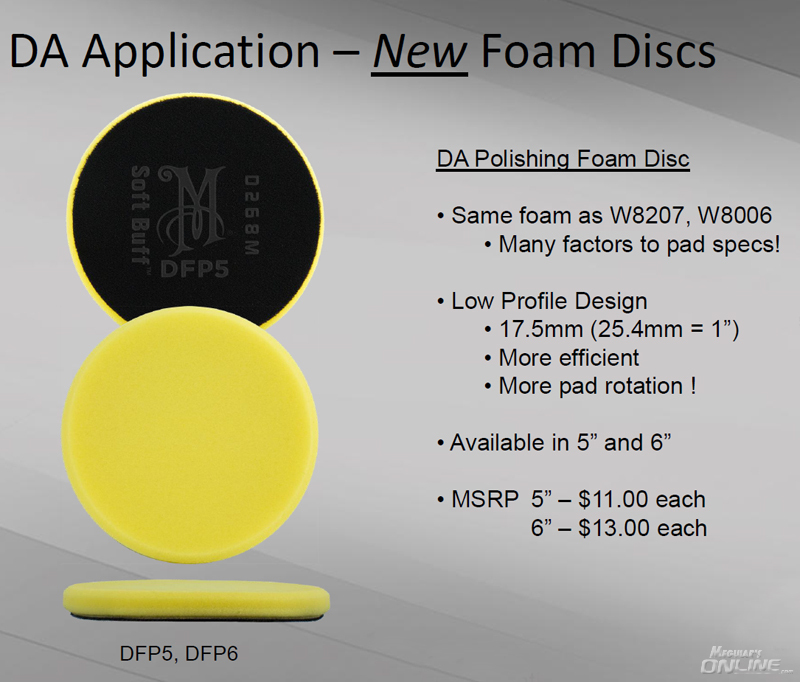 We are very pleased to announce an entirely new lineup of foam discs specifically for DA use. You read that right, "foam discs" rather than pads. These are very low profile (17.5mm or about 11/16") discs allow for better power transfer from the tool to the paint. What does that mean for you, the end user? More cut and a smoother feel through the tool! 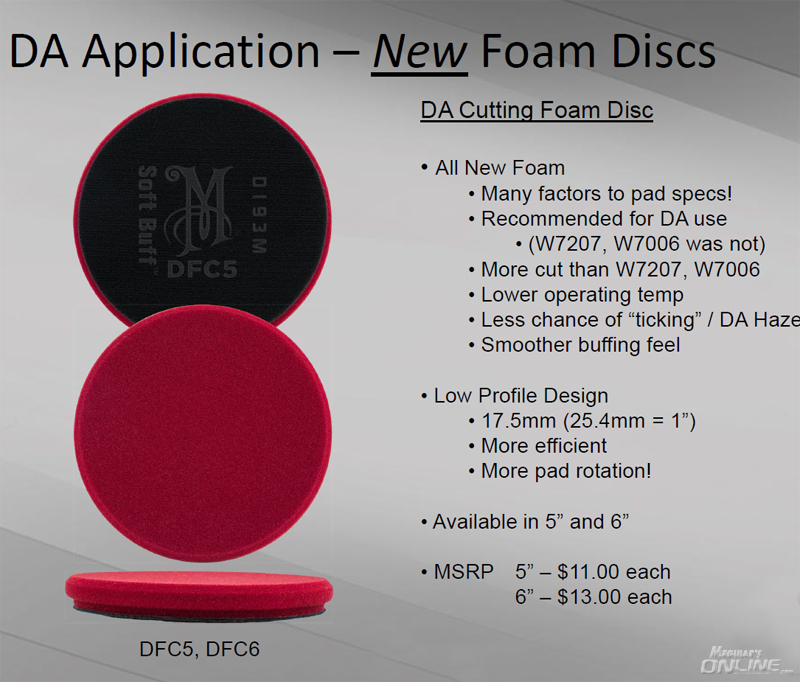 For the first time ever, we now offer a foam cutting disc for DA use. We used to caution against use of our previous foam cutting pads for DA use due to potential heat issues at the interface, as well as a high probability of hazing the paint. Well, with this new foam that's all ancient history. The color may be the same, but everything else about this foam is different, and it's fantastic on a DA buffer. This is the exact same yellow foam used in our Soft Buff 2.0 pads, but in this thin disc configuration you can expect an increase in cutting ability with your favorite compound or cleaner. A dramatic change in foam formulation means this new finishing disc will give you an even smoother feel while buffing, and deliver a better finish overall with your favorite finishing polish. Our 3" DA backing plate is now fitted with a permanent mount instead of the various options. We've even got built in markings to aid in visualizing pad rotation, so no more marking up the back of your backing plate so you can see if the pad is actually spinning! Three sizes for all traditional style DA buffers. 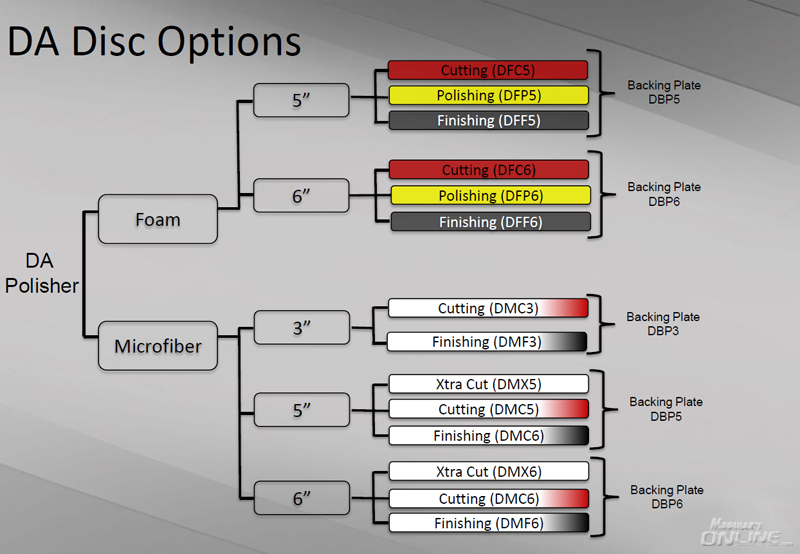 This handy chart guides you through pad and backing plate selection for DA use. Here's a little demonstration of the power of the new DFC5 foam cutting pad used with the new MT300 DA tool and Ultimate Compound. The tool was set to 4800 OPM and only moderate pressure was applied. Just one section pass was performed (up & down, side to side, repeat). The panel was then wiped x3 with a 20% IPA solution. The car had heavy swirls as well as holograms inflicted by a "professional" detailer. All I can say is WOW! Meguiar's look to have raised the bar again! I'm loving these new pads! My time with them has been pretty limited so far, but I'm definitely liking them! Well done Meguiar's!!! Finally the low-profile, 5" foam pads many of us have been waiting to see from Meguiar's for years! THANK YOU!! SOOOO happy that I didn't buy any new pads as I was hoping something like these came out this year. So excited to get my hands on them and great to already hear a few of you that have had the chance to use them and given great reviews on them. Will definitely be purchasing some as soon as they are available. This is great just in time too my pads are starting to look a little run down. We're pretty confident that you guys will love these new pads, and the cutting pad especially is a bit of a rock star! It's a whole new foam compared to our previous W7xxx series of burgundy foam. On the DA it is flat out amazing! Personally, I've used it on really hard paint and pretty soft paint as well, and in all cases it cut like a demon and left a great finish. Whether I was using M100, Ultimate Compound, White Wax or D300 the results were universally fantastic. We almost hate to say this, but if you've ever struggled with heavy haze on very soft paint when using microfiber pads, this new cutting pad is just an incredible alternative. 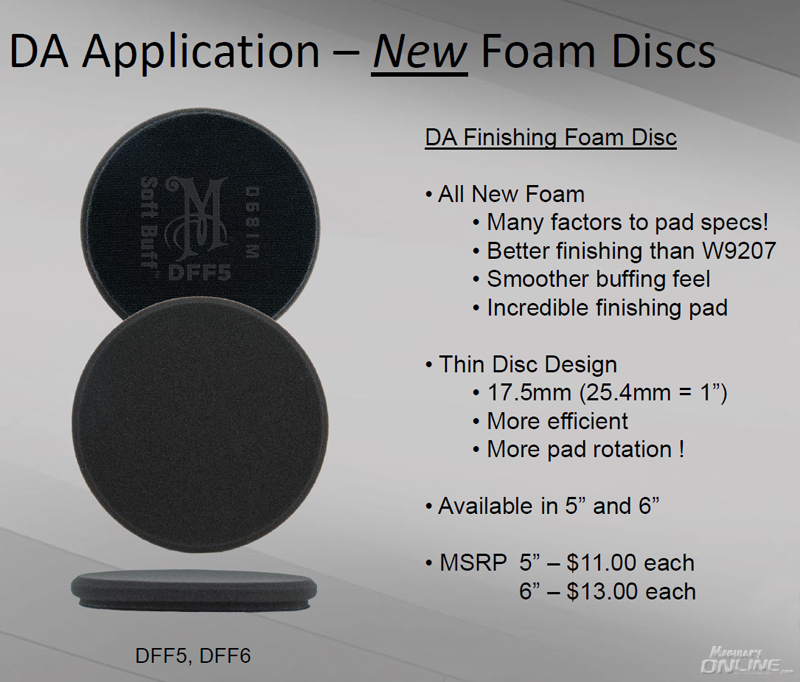 The finishing disc also uses totally new foam for even better finishing and smoother operation/feel. If you're currently using a G110v2 DA buffer, you'll notice the weight of these pads and their thin construction will pretty much transform that tool - it becomes much smoother in operation with these pads versus larger pads, whether our outgoing Soft Buff 2.0 pads or even other 6" pads. Can these new pads be used with the more powerful DAs like a flex 3401 or a Rupes 21? 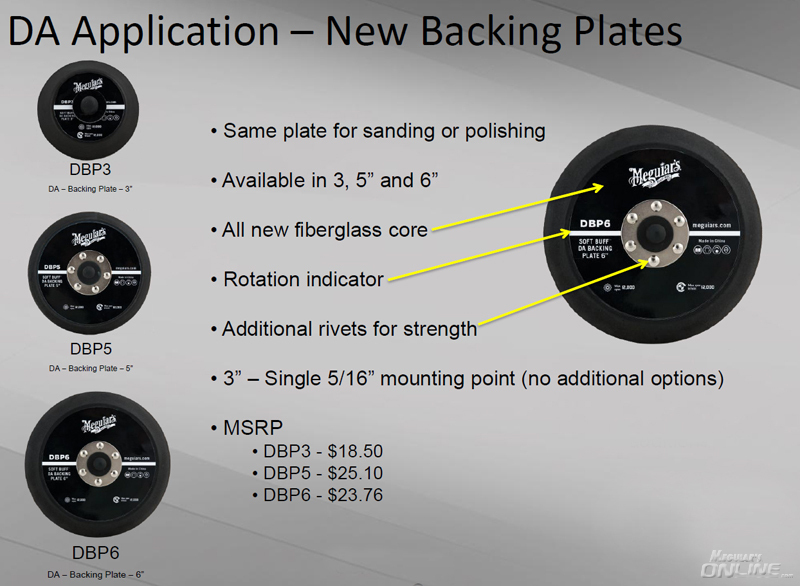 The new backing plates are optional for the new pads? No Velcro issues like when the MF pads came out and it was recommended that you only use the new/current backing plate?